Please update to add an option to ignore PvP realms. wonderful addon, love it! however, i only get it to work on one of my toons on the same account. it does not auto join groups on the other. i cannot figure out what the issue is. the working account is a shaman, the non working is a mage. i uninstalled mage nuggets, thinking it might be that addon, since that's really the only addon that's not being used by the working account, but that seems to not make a difference. other than that i am using elvui as the main UI. any help would be appreciated. i even thought maybe it had to do w the objective tracker window size (?) since i do not see the golden box when in a world quest area, while doing the quest, but since i am never grouped/get in a group on that toon, i cannot confirm i run out of space, not being able to show the all the quests PLUS that golden box for the current WQ, might that be why i don't get queued? Sometimes when entering a zone while in a party it does not start searching. It leaves the group as expected and prints that it will start searching now but then these errors appear and it does not start. 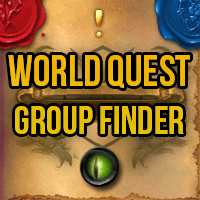 errMsg = "...dOns\WorldQuestGroupFinder\WorldQuestGroupFinder.lua:407: Usage: GetQuestTagInfo(questID)"
Message: Note: AddOn WorldQuestGroupFinder attempted to call a protected function (<unnamed>:Hide()) during combat lockdown. 1x [ADDON_ACTION_BLOCKED] AddOn 'WorldQuestGroupFinder' tried to call the protected function '<unnamed>:Hide()'. Ah, you're right. I guess it shows up when entering bonus objective areas. I'll disable it for those. Btw the addon will popup on non-max level chars when entering world quest areas, might wanna disable it if world quests are not unlocked. I just noticed that you are touching the watch frame, that will always taint sadly, as far as I know. Hey, thanks for reporting this. I'm a bit surprised though because WQGF never uses the ClearAllPoints() function. It's not even interacting with the WorldMapFrame. Are you using other WQ addons? Do you remember what you were doing when you got this error? Getting a lot of taint from this addon. Hello, Of course, there is no language restriction whatsoever. Just don't forget to tweak the language filter in the "premade groups" tool, because WQGF uses this to filter the groups you can join. Great addon !! but i have a question, if i run my game in french version, can i group with people who run the game in english version with this addon?